Embodiments of the invention provide a communication system including a processor and a memory coupled to the processor. The memory includes instructions executable by processor to communicate with a database comprising a plurality of visual integrated voice response (IVR) menus associated with a plurality of destinations. Further, the instructions executable by the processor for receiving a dialed phone number of a destination. Furthermore, the instructions executable by the processor for comparing the dialed phone number with phone numbers stored in the database. Additionally, the instructions executable by the processor for transferring to be displayed a form based on the comparison. Herein, the form comprises one or more data request fields corresponding to a visual IVR menu associated with the dialed destination. The invention relates to Interactive Voice Response (IVR) system and more specifically the invention relates to presentation and visual selection of IVR option from a caller device. Interactive Voice Response (IVR) technology is generally used to detect voice and key inputs from a caller. Various organizations such as banks, insurance companies, and other service providers use IVR technology to manage calls from their customers. Typically, IVR systems are used by organizations that have high call volumes. An objective for implementing the IVR system is to provide the customers with a quick and good experience. Moreover, the cost of providing the services is reduced. Typically, the caller calling the destination may have to listen and follow instructions on the menu to get a desired response or a function performed. Therefore, the process can be time consuming. Moreover, in case the caller provides an incorrect, input, the complete process may have to be repeated. Furthermore, the IVR menu for an organization may be updated or changed regularly. For example, extension numbers inside an organization may be changed and correspondingly, the extension numbers associated with the IVR menu may be updated. As a result, a frequent caller may not be able to reach a desired end by remembering a combination of numbers. Therefore, the caller may become frustrated with the IVR systems. Some prior art try to address this problem by providing visual form of IVR. These prior arts display the IVR menu graphically on a caller device. U.S. Pat. No. 7,215,743 assigned to International Business Machines Corporation and a published U.S. patent application Ser. No. 11/957,605, filed Dec. 17, 2007 and assigned to Motorola Inc., provides the IVR menu of the destination in a visual form to the caller. The caller can select the options from the IVR menu without listening to the complete audio IVR menu. However, the IVR menu displayed on the caller device is stored on an IVR server at the destination end. As a result, the visual IVR menu is specific to the destination and only the IVR of the destination dialed is displayed. These techniques therefore, require each destination to set-up hardware, software and other facilities to be deployed for providing visual IVR servers. Generally, the IVR menus of the organizations are in form of audible menu. Moreover, there are a large number of organizations that use IVR menus. Therefore, converting the audible menus to visual. IVR menus can be time consuming. An existing technique, as disclosed in U.S. Pat. No. 6,920,425 assigned to Nortel Networks Limited, discloses an automated script to convert the audible menus scripts to visual IVR menu scripts. However, the audible menus scripts must be available in a particular format to enable the conversion. Furthermore, the audio menu scripts must be available or downloadable for the program to function. As a result, only the audio menus scripts that are available can be converted to visual IVR menu scripts. Furthermore, the device of the caller must be designed or programmed to understand the visual IVR menu scripts. Various organizations encourage the customers to call them for information on their products or services, or for helping existing customers. Generally, a contact number is provided by the organizations on their website as a button. Therefore, when the customer presses the button a form is displayed. The customer then enters his contact number where an executive from the organization may call. However, this may be time consuming for the customer. Moreover, the customer may be not being able to talk to another executive during the call in case the on-line executive is not able to satisfy the customer. U.S. patent application Ser. No. 12/049,021, filed Mar. 14, 2008 and assigned to Harprit Singh, provides methods and systems for displaying an IVR menu, when the caller clicks a link on a webpage provided by the organization. However, the customer is still required to request the webpage with embedded information from a server of the organization. Moreover, the methods and systems are limited to the organizations that provide the required webpage to the customers. Other technologies include U.S. patent application Ser. No. 11/877,952 filed Oct. 24, 2007 and assigned to International Business Machine Corporation. The effectiveness of providing the IVR in visual form is discussed in a technical paper titled, ‘The Benefits of Augmenting Telephone Voice Menu Navigation with Visual Browsing and Search’ by Min Yin et al. 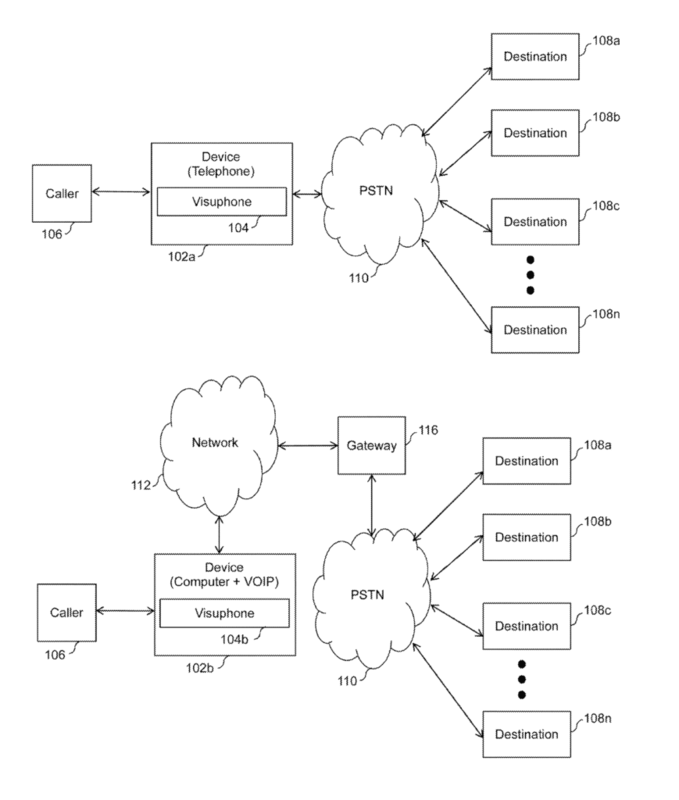 The paper discusses a setup where the visual content of the IVR is sent from a service provider to a computer connected to a mobile phone. However, the technique discussed in the paper is limited to the visual content provided by the service provider’s end, after the connection is established. Moreover, the providers are required to individually set up the hardware and services for providing visual content. As discussed above the existing technologies have various limitations. Embodiments of the invention provide a communication device comprising a database comprising a plurality of visual Interactive Voice Response (IVR) menus associated with a plurality of destinations. The communication device further comprises means for dialing a phone number of a destination, means for comparing the dialed phone number with phone numbers stored in the database, and means for displaying a form based on the comparison, wherein the form comprises one or more data request fields corresponding to a visual IVR menu associated with the dialed destination. Embodiments of the invention provide a communication device comprising a processor. Further, the communication device comprises a memory comprising a database. The database comprises a plurality of visual Interactive Voice Response (IVR) menus associated with a plurality of destinations. Further, the memory comprises instructions executable by the processor for dialing a phone number of a destination, comparing the dialed phone number with phone numbers stored in the database, and displaying a form based on the comparison, wherein the form comprises one or more data request fields corresponding to a visual IVR menu associated with the dialed destination. A method for providing enhanced telephony is disclosed. The method comprises dialing, at a communication device, a phone number of a destination. The communication device comprises a plurality of visual IVR menus associated with a plurality of destinations. Further, the method comprises comparing the dialed phone number with phone numbers stored in the communication device. Furthermore, the method comprises displaying, at the communication device, a form based on the comparison, wherein the form comprises one or more data request fields corresponding to a visual IVR menu associated with the dialed destination. An aspect of the invention is to provide to a caller using a device a visual IVR menu corresponding to an audible IVR menu of a destination. Another aspect of the invention is to enable the caller to directly interact with the visual IVR menu without listening to the audible IVR menu of the destination. Yet another aspect of the invention is to provide the visual IVR menu to the caller before establishing a connection of the device with the destination.